Ask fellow campers about "Lakeside Recreational Resort" and nearby attractions. It's a one mile drive down a good gravel road to get to the park. Interior roads are wide, and the big grass/gravel sites are level. The staff drove me around in her golf cart to show me which sites were available. We wanted a 50-amp site, and there was one back-in, one drive in and back out, and one where we drove through a couple of other sites to make it a pull-through. We chose the last one, and it worked out great. During the summer there are all sorts of recreational activities--paintball, a water slide into the lake, a swimming pool, etc. Since we were there in the off-season, it simply provided a quiet, pleasant, rural environment. There are a number of permanent residents here. They were friendly and kept their sites from looking like junkyards. We used their free Wi-Fi because the Verizon data signal was weak. The Wi-Fi was excellent. At the $10 Passport America rate for full 50 amp hookups, it was a bargain besides. We camped at Lakeside Recreational Resort in a Motorhome. This is my favorite RV park on the current trip. I spent two nights, but would enjoy going back for a longer stay. Owners were very friendly and welcome you in their golf cart to help you select a spot (or use self-pay station after hours) It's quiet, and there is a lot to do. It would be a great place to take the family. 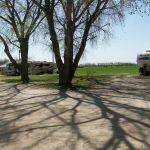 The campground has a private lake with a swimming beach, fishing, rafting etc. There is a swimming pool, trails, basketball courts, baseball field etc. There was free entertainment in the clubhouse the weekend I was there. The rest room and laundry room (3-washers and dryers) was clean, and showers offered plenty of hot water. We camped at Lakeside Recreational Resort in a Travel Trailer. This park was OK for an overnighter. It is an honor pay system. The road to the park is a gravel washboard. Laundromat consists of one washer and one dryer. You are to leave your money in an envelope after using the machines. People residing near the park speed through the park at all hours. Will not stay here again. We camped at Lakeside Recreational Resort in a Fifth Wheel. Go very slow on dirt road in. Some ruts. We took a nice walk around the lake and down the road past the campground. They must not get many walkers. A farmer stopped and asked if we needed help. Very friendly. When we told him we were travelling he wished us well. Are you affiliated with Lakeside Recreational Resort ?